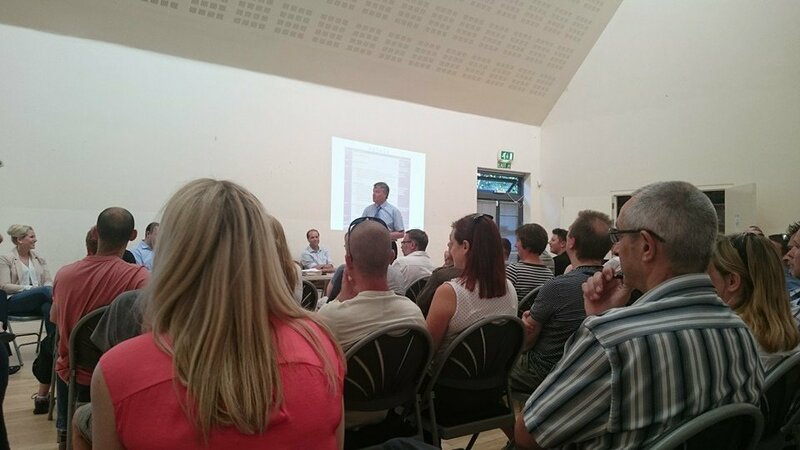 On Friday 22nd July, over 100 residents from Whiteley attended a community broadband briefing with the Hampshire County Council broadband team, executives from BT and Openreach, chaired by Fareham Borough Council leader Councillor Seán Woodward. The event was also attended by Suella Fernandes, MP for Fareham, and George Hollingbery, MP for the Meon Valley. Stacey King and Grant Munn from BT and Emma Howarth from Openreach gave presentations on the network issues in Whiteley and how these will be resolved. Glenn Peacey from the Hampshire Superfast Broadband team gave an overview of the superfast broadband programme and which cabinets in Whiteley will be upgraded under the programme. The Whiteley broadband facebook group highlighted going issues with broadband speeds and reliability of services across the Whiteley area. After escalation to a high level at both BT and Openreach technical faults were found in the Whiteley exchange which were affecting the reliability of broadband across the Whiteley exchange area. Considerable engineering work is now under way in the Whiteley exchange to replace equipment and thereby restore more reliable ADSL and ADSL2+ broadband to those served by the Whiteley exchange. The repairs to Whiteley exchange will lay the foundations for the Hampshire Superfast Broadband Programme's roll-out to the area in 2017. Whiteley cabinet numbers 57, 58, 59, 101, 103, 104, 105 and 110 will be upgraded by December 2017, providing speeds of up to 80 Mbps. Cabinet 55 on Silver Birch Way was upgraded by the programme in October 2015 and 117 on Bluebell Way was upgraded in March 2016. We would like to urge residents of Whiteley who have not already done so to register on our website, www.hampshiresuperfastbroadband.com. We will then be able to notify residents when their cabinet has been upgraded under our programme.